We have an offer of complementary dishes which finish the entire dish and the main course of meal. 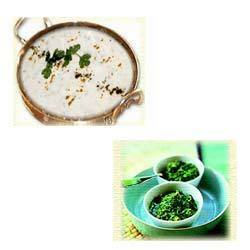 Using healthy and fresh dairy product these Raita And Chutney are prepared which are garnished with spices and leafy food materials like mint, cardamom and cinnamon. These are kept at low temperature which maintains their authenticity and hygiene.